12. 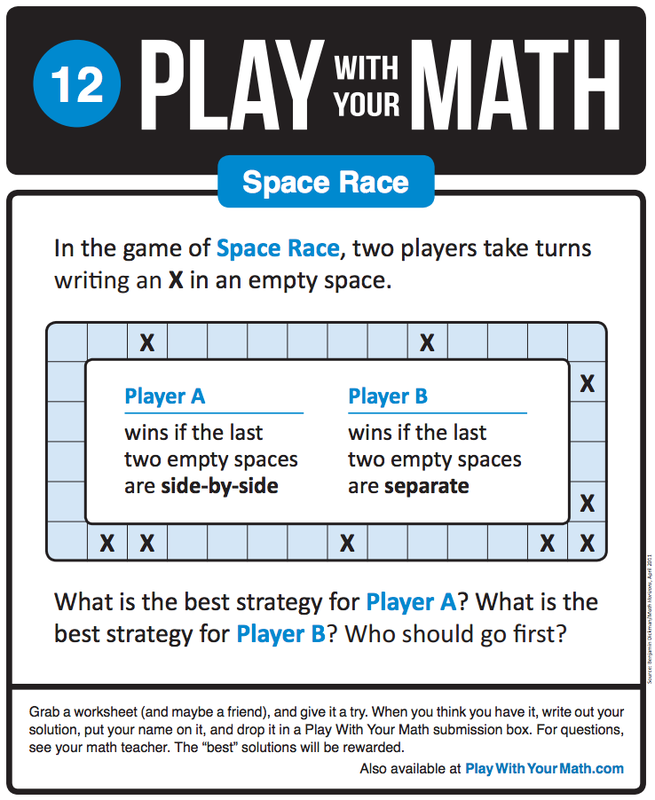 Space Race – Mister, is this right? On Friday, we shared Play 12. Space Race with our students. 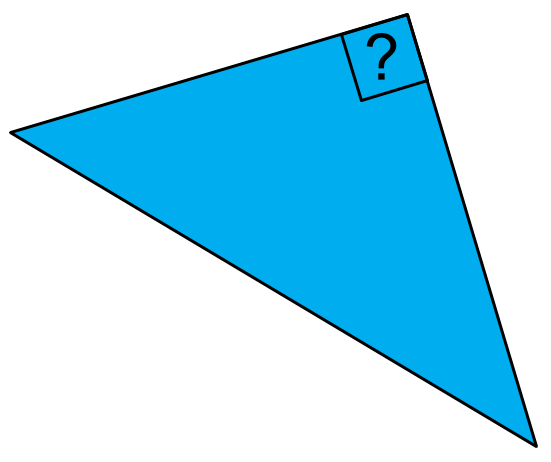 Here is a sketch of how this problem developed. 1. Find a fun problem. April’s Sandbox problem comes from Benjamin Dickman of Columbia University Teachers College. On the first day of math class, thirty-six desks are arranged in a circle for eighteen boys and eighteen girls. The teacher says that students can take turns choosing their own seats as long as the gender of the students alternates between turns.The last two students to pick will be Amanda and Bill (not necessarily in that order). Bill has a crush on Amanda and is determined to sit next to her. Amanda, on the other hand, can’t stand Bill and is determined not to sit next to him. All the boys want to help Bill, and all the girls want to help Amanda, which sets up Problem 258, You Can’t Please Everyone: which gender should pick first, and why, if the decision is up to Amanda? If the decision is up to Bill? 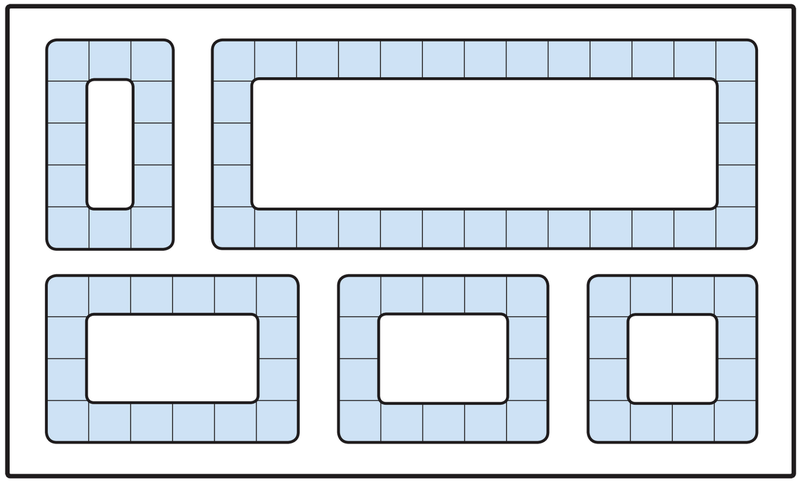 Ben added two suggestions: 1) that we could choose a smaller number of desks (e.g. 12), and 2) rephrase the context to get rid of the gender elements. We played around and solved the problem ourselves, and we agreed with Ben – this was a fun problem that our students would enjoy … if we could make it accessible. 2. Re-write the problem so that it is visual and concise. This problem was wordy, and for a long time, it sat on the shelf as a candidate that wasn’t yet ready to become a Play problem. I took forever to wrap my head around how to adjust this problem, but one day, inspiration struck: it’s a game. Bill and Amanda both want to “win,” but they have different criteria for success. And with that, Amanda and Bill became Player A and Player B. Desks became squares. Students became X’s.The rectangular shape ensured an even number of “desks.” Stripped of the gossip-filled classroom context, it retained the same mechanics and underlying mathematics. I sketched a draft on paper, CiCi (aka Ms. Yu) masterfully brought it to life in InDesign, and we sat down together over February break to tinker and refine. We tried out several different versions of the wording of the problem. 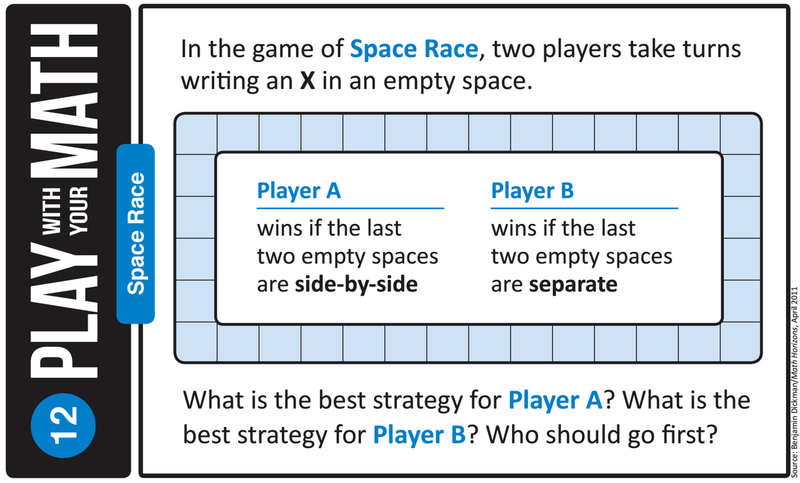 Are the squares “boxes” or “spaces”? What should the title be? Are the last two spaces “adjacent” or does that vocabulary need defining in order for the problem to remain maximally accessible? How do we phrase the prompt at the end to show that this is not simply a game, but a problem that can be solved? When we sent the draft back to Ben, he misinterpreted what the X’s in the board meant. The X’s are intended to show a game currently being played. He thought that they represented the starting board, adding a new constraint to his original problem. We made a handout so students could play with the problem, and made sure that the board was blank, hopefully erasing the potential confusion. On the back, we initially planned to add a smaller version with only 12 spaces as Ben had originally suggested, but that only takes up so much space. CiCi did some quick copy/pasting/resizing and all of a sudden we had a beautiful variety of playing board options. We posted it on Friday and used it in our classes as a Friday Warm Up. It wasn’t easy to make them stop so I could start class. I encourage you to print out the board and play along with us! Pass along my compliments to Ms. Yu for the outstanding graphic design. Get an email subscription plugin asap okay.